Palestinian surgeons in the Gaza Strip were discussing medical options on Wednesday after the unexpected birth of conjoined twins - baby girls who share one heart and one body. 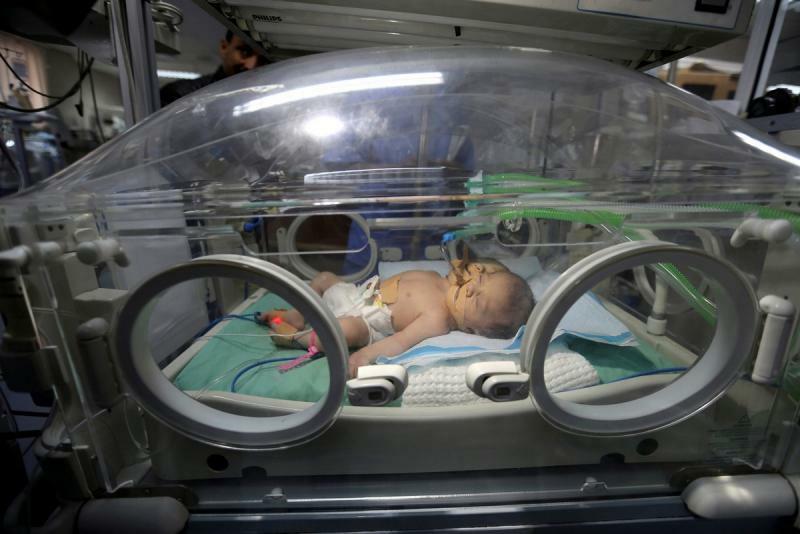 "We thought they were twins and we would have no problem, but we discovered that it is a Siamese baby," said Hanan Al-Wade, a paediatrician at Al Shifa, Gaza City's main hospital. "The body is one but with two heads." The babies were born by Caesarean section on Tuesday and are being kept under close monitoring in an intensive care unit. They have not been named. Doctors said they had not decided whether to attempt to separate them. If they try, they also need to consider whether they can perform the operations in Gaza or should try to move the children to a hospital in Israel or abroad. "Separating them is very hard because they are sharing many organs and they have a defective heart," said Wade. Reuters television pictures showed the two, joined to the body just below the neck, struggling to breathe inside an incubator. The baby's chest was heaving up and down rapidly as the heart worked to pump blood. Conjoined twins occur around once in every 200,000 live births. The survival rate is usually between five and 25 per cent, doctors say. Around 70 per cent of all conjoined twins are girls.